When I taste the blend of chocolate, caramel, nougat and peanuts, I see myself as an 8-year-old playing with small army men at my Uncle Steve's house. It takes me back to being with my cousins and watching things like the "Gorgeous Ladies of Wrestling" and performing with a Casio keyboard. 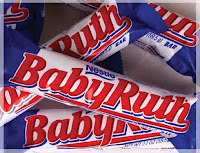 The Baby Ruth is my madeleine, an item that brings back an involuntary memory. Madeleines typically affect either taste or smell. Some memories can be long gone, but if the madeleine is tapped into, they come back. This idea is key to Marcel Proust's "In Search of Lost Time," which is also titled "Remembrance of Things Past." A madeleine is a French cake that when tasted gives the book's narrator an awakening. Honestly, I don't read Proust because I find it too inaccessible, but I love the idea of the madeleine because I've experienced it many times. "Hey, it smells like grandma's house." "Mmm, that tastes like grandma's soda pop." "Oh, man, Baby Ruths are the best candy bars!" I have discovered that nearly everyone has a madeleine. What is yours? The sensation also is called synesthesia, and I love how it sneaks up on you. To me, some madeleines are connected to the holidays. A pine smell = Christmas. Cheap champagne = New Year's Eve. Semi-drunk at Church = Midnight Mass. And we can argue about this all day, but the Baby Ruth is by far the best candy bar. Perhaps its taste is debatable, but the meaning it has in my life puts it on a pedestal. For as long as I can remember, my Uncle Steve has been a proponent of Baby Ruths as are his children and me. His father, my grandpa, eventually had his health fail, but even during that time, he often would ask to eat "A Ballplayer," a reference to the glorious Baby Ruth.